Over the past decade, verification complexity and demands on engineering teams have continued to rise rapidly. Applying innovative solution flows, automation tools, and best-in-class verification engines is necessary to overcome the resulting verification gap. 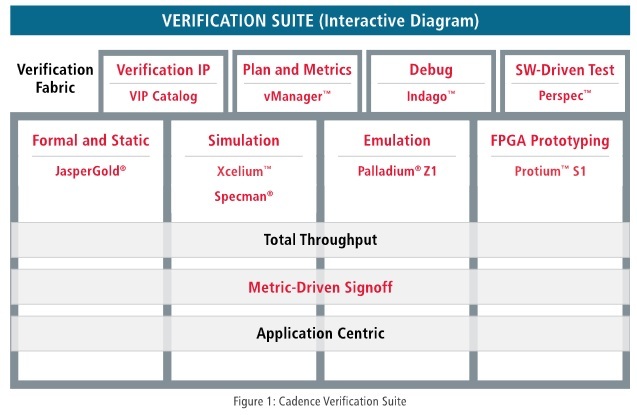 The Cadence® Verification Suite combines the market- and technology-leading JasperGold® Formal Verification Platform, Palladium® Z1 Enterprise Emulation, the Xcelium™ Parallel Simulator, and the Protium™ S1 FPGA-Based Prototyping Platform with fabric technologies across the core engines. As electronic products across all market segments become more sophisticated, developing their underlying hardware and software–and integrating the two sides–continues to grow more complex. Early software development, hardware verification, hardware/software integration, and integrated system validation have become primary challenges, increasing development costs, project schedules, and risks. Using the Cadence Verification Suite, you can reduce system integration time by up to 50%, accelerating IP development, system-on-chip (SoC) integration, and concurrent hardware/software development. The verification suite is comprised of core engines, verification fabric technologies, and solutions spanning these technologies, as shown in Figure 1. The verification fabric provides automation, debug, tracking, management, and measurement of verification tasks across verification flows and engines, which improves productivity and increases team collaboration and productivity. Solutions in the Verification Suite are predefined flows and best practices to address common challenges, including total throughput for the shortest project schedule, metric-driven signoff for quality, and application-specific challenges for mobile, networking and servers, automotive, consumer and internet of things (IoT), aerospace and defense, and other vertical segments. Our Verification Suite engines, fabric technologies, and solutions support a broad range of industry standards, are open for third-party integration, and are further augmented by our ecosystem partners, including Arm and many others.